Aurangzeb Alamgir invaded Varanasi and destroyed the original Vishwanath temple at Gyanvapi ("Well of knowledge") complex and erected this mosque from the parts of the temple (beyond dispute from this photograph). 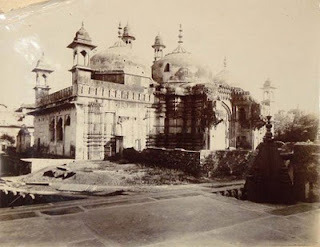 Later Marathas captured the city and reconstructed the new Vishwanath temple which is seen today. But they spared the mosque, as it was Shivaji's order, ".. fight muslims but don't destroy their holy places". Hope some radical Hindus (who claim to be his followers) are listening ! 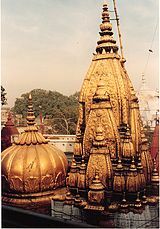 The temple (reconstructed few hundred metres away) stands today as one of the holiest of Hindu shrines, shrouded with nearly a ton of gold.